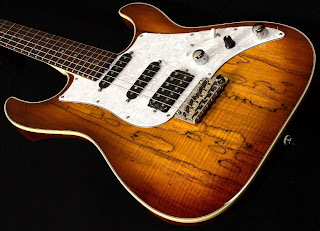 The Guitar Column: Tyler Studio Elite HD Spalted Maple Top on eBay! According to the seller this was the first Tyler guitar built in 2010 and bears serial number 10001. This gorgeous Tyler Studio Elite HD weighs in at 7.3lb, features a Honeyburst finish on a bent spalted maple top on a mahogany body, multi-layer white/black binding, white pearloid pickguard and a maple neck with an Indian rosewood fingerboard. Check out the peghead pic for a close look at Tyler's 'rolled' fingerboard edge at the first fret next to the low E! Pickups are a pair of JT S2 Hot Laura single-coil pickups and a Tyler Studebaker humbucker in the bridge. Electronics are classic Tyler -- single volume and tone controls, 5-way switch and a Demeter mid boost preamp with on/off button switch which is great for kicking in on leads. The Demeter mid-boost also manages to fatten out single-coil pickups to the point that they almost sound like full humbuckers. Hardware on this Tyler Studio Elite HD includes locking HipShot tuners and a G2RV bridge with Raw Vintage saddles which replicate the heavier high-mass steel Fender saddles of old. It has such a beautiful body, wonder why they settled for a headstock devoid of any creative curves. I know what you mean. A spalted maple headstock veneer would have been interesting! 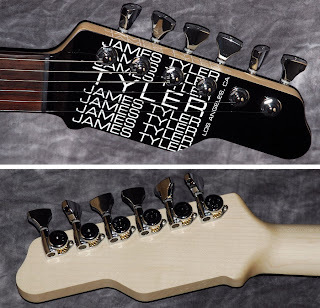 The Tyler headstock design is often a hot topic. I don't dig it so much, but they're awesome guitars! Congratulations on the dot com JP!